A remarkable tumult occurred in October of this year, at Antwerp. A Carmelite monk, Christopher Smith, commonly called Fabricius, had left a monastery in Bruges, adopted the principles of the Reformation, and taken to himself a wife. He had resided for a time in England; but, invited by his friends, he had afterwards undertaken the dangerous charge of gospel-teacher in the commercial metropolis of the Netherlands. He was, however, soon betrayed to the authorities by a certain bonnet dealer, popularly called Long Margaret, who had pretended, for the sake of securing the informer’s fee, to be a convert to his doctrines. He was seized and immediately put to the torture. He manfully refused to betray any members of his congregation, as manfully avowed and maintained his religious creed. He was condemned to the flames, and during the interval which preceded his execution, he comforted his friends by letters of advice, religious consolation and encouragement, which he wrote from his dungeon. He sent a message to the woman who had betrayed him, assuring her of his forgiveness, and exhorting her to repentance. His calmness, wisdom, and gentleness excited the admiration of all. When, therefore, this humble imitator of Christ was led through the streets of Antwerp to the stake, the popular emotion was at once visible. To the multitude who thronged about the executioners with threatening aspect, he addressed an urgent remonstrance that they would not compromise their own safety by a tumult in his cause. He invited all, however, to remain steadfast to the great truth for which he was about to lay down his life. The crowd, as they followed the procession of hangmen, halberdsmen, and magistrates, sang the hundred and thirtieth psalm in full chorus. As the victim arrived upon the market-place, he knelt upon the ground to pray, for the last time. He was, however, rudely forced to rise by the executioner, who immediately chained him to the stake, and fastened a leathern strap around his throat. 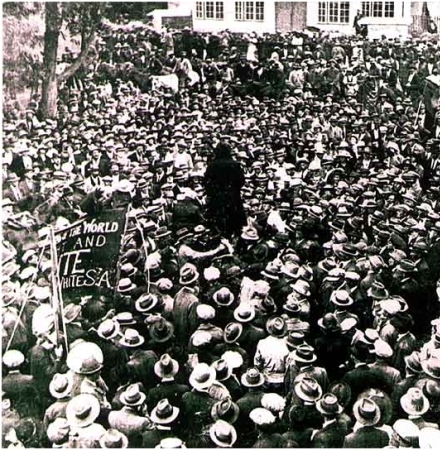 At this moment the popular indignation became uncontrollable; stones were showered upon the magistrates and soldiers, who, after a slight resistance, fled for their lives. The foremost of the insurgents dashed into the enclosed arena, to rescue the prisoner. It was too late. The executioner, even as he fled, had crushed the victim’s head with a sledge hammer, and pierced him through and through with a poniard. Some of the bystanders maintained afterwards that his fingers and lips were seen to move, as if in feeble prayer, for a little time longer, until, as the fire mounted, he fell into the flames. For the remainder of the day, after the fire had entirely smouldered to ashes, the charred and half-consumed body of the victim remained on the market-place, a ghastly spectacle to friend and foe. It was afterwards bound to a stone and cast into the Scheld. Such was the doom of Christopher Fabricius, for having preached Christianity in Antwerp. During the night an anonymous placard, written with blood, was posted upon the wall of the town-house, stating that there were men in the city who would signally avenge his murder. Nothing was done, however, towards the accomplishment of the threat. The King, when he received the intelligence of the transaction, was furious with indignation, and wrote savage letters to his sister, commanding instant vengeance to be taken upon all concerned in so foul a riot. As one of the persons engaged had, however, been arrested and immediately hanged, and as the rest had effected their escape, the affair was suffered to drop. This date in 1570 marked the remarkable Edinburgh hanging of a preacher for murdering his wife. In the sixteenth century a strange fatality attached to the incumbency of this quiet rural parish … Robert Galbraith, parson of Spott … was murdered in 1543 by one John Carkettle, a burgess of Edinburgh. The next rector, John Hamilton … [became] the Archbishop Hamilton of Queen Mary’s reign. He was taken prisoner at the capture of Dumbarton Castle in 1571, and was hanged at Stirling for complicity in the assassination of the Regent Moray … The fate of the archbishop’s successor in the manse of Spott, the first minister of the new and purified Kirk, forms the subject of the present study. Young Kello presumably fancied Spott a station on his own cursus honorum towards archbishoprics and assassinated regents; he found himself irksomely constrained by the cheapness of the parish wage (which drove him into speculative debt) and by his “amiable but plebeian consort” Margaret Thomson. “Thir wer the glistering promises whairwith Sathan, efter his accustomed maner, eludit my senses,” Kello’s eventual confession would sigh. Specifically, Sathan suggested he lose the wife and upgrade to a socially-advantageous match with a lord’s daughter. On September 24, 1570, Kello came upon his spouse defenseless in prayer, and strangled her with a towel. Reverend John strung up his infinitely self-sacrificing wife to make it look like she’d done herself to death, went out, preached — it was Sunday — and returned home with some guests, ever-so-casually coming upon the poor woman’s dangling body to great surprise and chagrin in the presence of witnesses. And this ruse worked, at first. Kello began entertaining sympathy calls from neighbors; it’s unremarked in the existing documentation, but it’s conceivable that the body of the presumed suicide might even have been mutilated or dishonored as was the style at the time. Overacting the part a bit, Kello sought out the counsel of a brother-minister by the name of Andrew Simpson over the question of the probable disposition of his self-murdering wife’s soul. This Rev. Simpson had tended Kello during a sickness prior to Kello’s wife’s passing, when the Parson of Spott had Sathan’s cogitations in mind. And apparently, Kello related at that time a strange dream that Simpson would on the subsequent visit turn into a supernatural Colombo moment, reciting back that past phantasm plus Simpson’s interpretation of it that it denoted the dreamer’s blood guilt. This gave the heretofore icily hypocritical Reverend John such a case of the heebie-jeebies that he proceeded to Edinburgh to turn himself in. Measoure not the treuth of Godis word altogether be the lyvis of sic as are apointed pastouris ower you, for thei beir the self same fleshe of corruptioune that ye doe, and the moir godlie the charge is whairunto thai are called, the readier the Enemie to draw thame bak from Godis obedience. 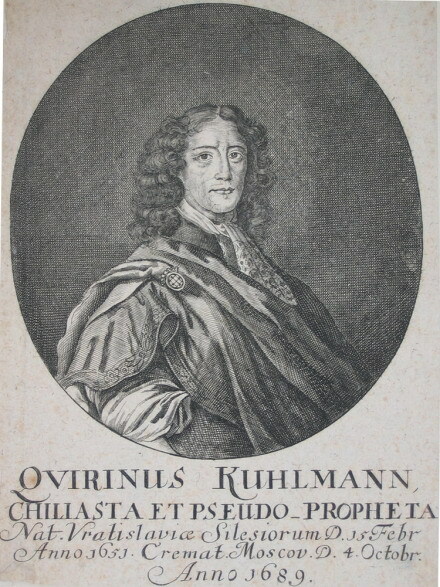 On this date in 1689, German poet and mystic Quirinus Kuhlmann was roasted in Moscow for heresy. This Silesian millenarian (English Wikipedia entry | German) experienced a mystical conversion and spent his law school hours instead scribbling visionary poetry and devouring visionary texts. Inflamed with Bohmian fire, I read Bohme with fiery eagerness and capacity. I did not know the Bohmian texts and I knew them the same day. What an admiration (o Jesus!) overcame me when I heard Bohme tell his revelations which I had learned from the universe of nature, with God as my teacher, it were the revelations the first outlines of which I just had begun to delineate in my own works. Kuhlmann could have picked a better time to evangelize Russia than the reign of Peter the Great. This progressive despot did indeed look west for Russia’s future: in industry, in law, in war, even in fashion. But certainly not in holy alliances. 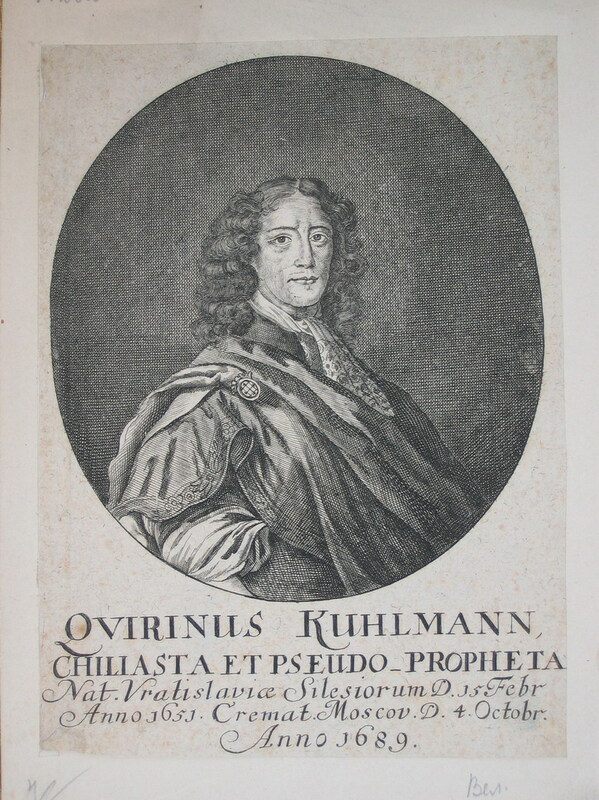 It was a fellow-German in Moscow, a Lutheran pastor, who denounced Kuhlmann as a dangerous heretic. He and a follower were duly burned as such.